Cisco Partner Summit Let battle be joined; Cisco has re-entered the storage market via the hyper-converged infrastructure appliance door, with its HyperFlex* system able to separately scale performance and capacity. It uses Springpath HALO software, as many thought it would, and places Cisco in direct competition with other HCIA vendors, particularly the two leading startups – Nutanix and SimpliVity – the latter of which is a Cisco partner and has sold 1,000 systems based in Cisco's UCS servers. Cisco's HyperFlex appliances will also compete with VCE partner EMC's own VxRail products. 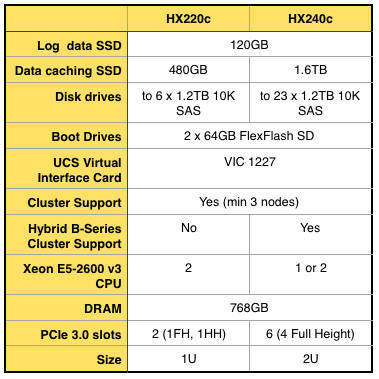 There are two HyperFlex appliances: the 1U HX220C and the 2U HX240C, both hybrid flash/disk systems. Cisco is positioning these converged systems as being part of a continuous convergence trend in its products, starting with networking – Nexus – and continuing with UCS, described as a converged server. 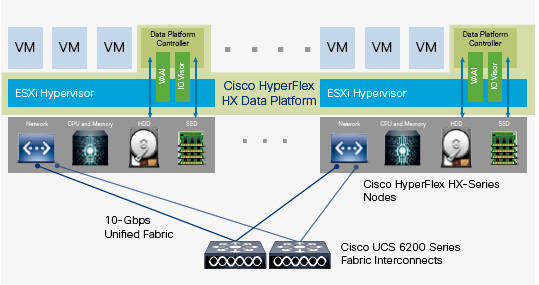 Now the HyperFlex line converges the network fabric, UCS compute, storage and hypervisor software. They can scale compute and storage capacity separately, Cisco says, and integrate with Cisco's existing management facilities. It says it intends to take hyper-convergence mainstream in the enterprise and accelerate it, with what it calls the most significant advancement in data centre technology since the launch of UCS. Cisco's HyperFlex systems provide a so-called data platform that spans three or more HX-Series nodes in a highly available cluster. Each node includes a Data Platform controller implementing a distributed file system using internal SSD and disk drive media. The controllers communicate with each other over 10 GbitE and present a single pool of storage spanning the cluster nodes. There are two HyperFlex HX systems: the HX220C and HX240C. They use UCS B-Series blade and rack servers as cluster nodes. These nodes have a mix of disk and solid state drives whose capacity is combined into a distributed multi-tier object store. Data is deduped and compressed inline. The SW features thin provisioning, snapshots and clones. HX systems are designed to support virtualised, containerised, and bare-metal environments, with VMware vSphere supported at first customer ship. That suggests Hyper-V and KVM hypervisor support may be coming. Compute can be scaled by adding UCS blades with capacity scaling from additional HX nodes. There are configurable processor, memory, SSD and HDD options. Management is via Cisco's UCS manager; so it's basically the same as other UCS remote- and branch-office, enterprise computing, big data, and web-scale bare-metal environments. Data services are managed through vCenter with things like snapshots and cloning using VAAI (VStorage API for array intergration). Data is dynamically placed, Cisco says, in server memory, caching (flash), and capacity tiers to maximise application performance. However no performance numbers have been released, though Cisco execs say the systems have performed really well in customer testing. Incoming data is distributed – mapping to stripe units – across cluster nodes to optimise caching. The number of data replicas is controlled by a settable policy. Multiple streams can write at the same time. Data is written to the local SSD cache and the replicas are written in parallel to remote SSDs before the write operation is acknowledged. Cisco suggests this is in contrast to other architectures that use a locality approach. HyperFlex nodes can be deployed in less than an hour, Cisco says, including the network elements. Cisco emphasises that its HX systems converge and integrate UCS compute, HX platform software, and software-defined networking that integrates with Cisco's ACI (application-centric infrastructure), and is included in the ACI architectural framework. By adding Cisco's Enterprise Cloud Suite, customers can turn HyperFlex into an IaaS (infrastructure-as-a-service) system inside a hybrid cloud, with an integrated service catalogue. It leads with the ability to scale compute and capacity separately. Cisco says hyper-converged system revenues are expected to grow at 65 per cent CAGR from $1.9bn in 2016 to $4.8bn in 2019. What does Nutanix think about Cisco's HCIA market entry? CMO Howard Ting said; "Cisco's entry into the market is not a surprise, as they are the last server vendor to fully embrace HCI. Nutanix has built not only the industry's leading HCI product, but a full-blown enterprise cloud that includes integrated virtualisation, rich automation, app mobility, and native security. Time will tell if Springpath, with its yet unproven technology, can recreate both an EMC and VMware to become a viable alternative to AWS." SimpliVity CEO Doron Kempel said; "It's business as usual for SimpliVity." He tells us; "Cisco and SimpliVity have recently surpassed 1,000 systems sold together to over 200 customers – many of which are global leaders – and over 350 Petabytes of data stored, practically in just 3 quarters of selling together. It is a proven hyperconverged solution – running mission-critical applications at some of the world's largest data-centers; and often a complete transformation of all applications and all sites, to hyper-convergence. And it is the only hyper-converged solution available that delivers the functionality, data-efficiency, resiliency and performance that high-end enterprise customers require, with a TCO that is 3x lower than legacy infrastructure." Here are key points: "We continue to view Cisco as an outstanding partner – one that has a long track record of doing what's in the best interest of their customers and partners, and engaging with a wide range of technology providers. In the converged infrastructure (or integrated systems) space we saw Cisco partner with EMC/VCE, NetApp, Nimble and others. In fact, while being an investor in VCE, Cisco arguably sold more Flexpod systems with NetApp. We expect Cisco to operate similarly in the hyper-converged infrastructure space. In other words, it will very much depend on the technology that end-users prefer." We now have two hyper-converged startups with momentum – Nutanix and SimpliVity – plus three mainstream suppliers with HCIA products – Cisco, EMC and HPE. There is also Lenovo with DataCore software, as well as SW-only HCIA vendors such as Atlantis and Maxta. It seems highly likely that HCIAs will go mainstream. The possibility is that the mainstream suppliers could grow, alongside Nutanix with its market position and momentum, SimpliVity with its ASIC-acceleration and software technology, and DataCore with its parallel I/O technology, with the SW-only vendors placed in a threatened position. Cisco says the HX appliances have 30 per cent better TCO than competing systems. * "HyperFlex" is a common term. To clarify, Cisco's HyperFlex is not Condor's flexible virtualised architecture (HyperFlex), and neither is it Altera's HyperFlex FPGA architecture nor a FootJoy golfshoe.